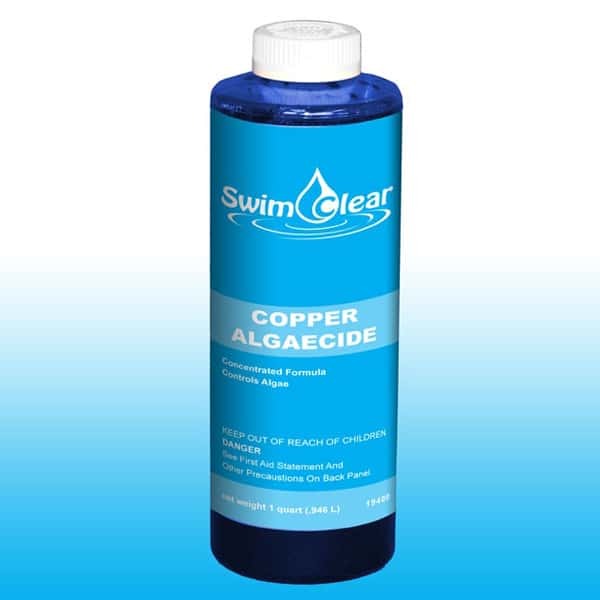 Turn your green swimming pool blue again with Copper Algaecide. Has your outdoor swimming pool become a green swimming pool swamp, overgrown with algae that seemed to appear overnight? Swim Clear's Copper Algaecide is used to kill existing algae and to preemptively help control algae growth in swimming pools. It is 3% Elemental Copper, making it a powerful pool algaecide that is compatible with all of the pool chemicals you already use. It is pH Neutral, non-foaming and kills all forms of algae that you will find in your pool. If you're looking for Coppercide, you have come to the right place. Copper Algaecide also goes by the name Coppercide. With Swim Clear, the copper component will not stain your liner like other brands.